Women who have worked, or grown up, on a farm have a much higher risk of getting breast cancer, a study claims. Stirling University researchers said women who then worked in healthcare further increased their risk, although more research is needed to explain why. The study raises fresh concerns about the risk posed by weed killers and chemicals containing chlorine. However, Cancer Research UK said the study of 1,100 women was too small a group to draw any conclusions. 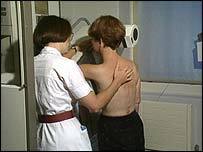 The research claimed that 137 Scottish women could die each year from breast cancer brought on by their work. Those involved in the study said more work was needed to identify the link between different jobs and cancer. But they said the research justified better control of potentially harmful chemicals. It found that women with breast cancer were three times as likely to have grown up on a farm or worked in agriculture. Those women who then went on to work in healthcare and car manufacturing increased that risk even further - with breast cancer rates up to four times the national average. Professor Andrew Watterson, from the university's Occupational and Environmental Health Research Group, said the women could have worked on a range of farms, such as dairy or arable. In the UK, such as parts of East Anglia, there would also be lots of young women working or growing up on farms, he said. Estimates were that about 4% of all cancers were related to or caused by occupations, he said. For the study, the researchers looked at women aged 55 or younger. They analysed data from 564 women with breast cancer and 599 women in a control group. Toxic chemicals, either alone or in combination, may influence the initiation and progression of cancer. Studies have suggested that emerging breast tissue cells could be vulnerable to chemicals, researchers added. Presenting their findings, the authors said: "The results indicate that women with breast cancer were nearly three times more likely to have worked in agriculture when compared to the controls. "Although the individual contribution of automotive-related manufacturing alone was not significant, the risk for those who worked in agriculture and subsequently worked in automotive-related manufacturing was further elevated. "The individual contribution of healthcare alone was not significant, however, the risk for those employed in agriculture and subsequently employed in healthcare was elevated. 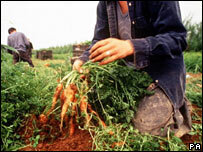 "Agriculture jobs tended to be among the first worked, often during adolescence." The authors said there was evidence of an association between breast cancer and some pesticides, adding that a large number of pesticides were also hormonally active. They said nurses and other healthcare workers were potentially exposed to ionising radiation, antineoplastic drugs, anaesthetic waste gases and viruses possibly associated with cancer risk. But Henry Scowcroft, the science information officer for Cancer Research UK, said: "This is too small a group to be able to draw any firm conclusions about a possible link." He added: "Scientists have also looked at whether environmental toxins might also contribute to the increase in breast cancer, but have found no conclusive link."